Join the Methow Valley Ranger District, North Central Washington Audubon Society, and HawkWatch International this fall for the fifth annual Chelan Ridge Hawk Migration Festival! 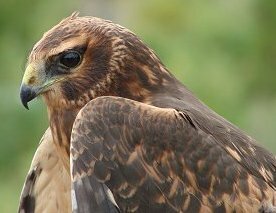 This free family event combines activities in Pateros with a field trip to the Wells Wildlife Area and trips to the Chelan Ridge HawkWatch site to learn about and celebrate raptors as they journey to winter territories. This all happens at Memorial Park in Pateros, Washington, on September 13th, from 8 am to 3 pm. You will get to visit vendors, see raptor demonstrations, listen to live music, and take a trip to the spectacular Chelan Ridge Raptor Migration Site. During the day, shuttles will run from Pateros to Chelan Ridge where visitors can see raptors such as Cooper’s Hawk up close when they are banded and released. Chelan Ridge sits 5675 feet above sea level along the flyway of migrating raptors. Biologists who live at the Ridge during the migration season will offer insight into what it is like to live and breathe raptors and show how the birds are banded and tracked. This is an amazing experience with environmental education and interpretation conducted by on-site educators, Forest Service personnel, and volunteers.